Maroni Presidente was a list in support of Roberto Maroni, the successful presidential candidate for the regional elections in Lombardia, 2013. Maroni being the current leader of the Lega Nord, he was supported by the center-right parties, in particular PDL, his own Lega Nord, FdI and Partito Pensionati. The presidential list received 11 seats in the regional parliament. 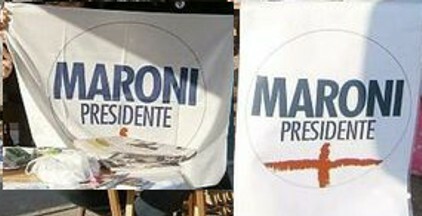 The list symbol showed on a white background the blue inscription "MARONI PRESIDENTE" over a sketchy red cross (the traditional symbol of Lombardia as well as symbol of the Lega Nord). The flag was white with the symbol .